CSI will be closed for voice communication on Thursday, November 28th for the Thanksgiving holiday. U.S. exchanges will be closed, but data from other exchanges will be available as usual. The CSI staff wishes you a Happy Thanksgiving! CSI's new Position Manager makes it simple to track the progress of your financial holdings in world markets, whether they involve stocks, funds, futures, options, indices, or all of the above. This program lets you update quotes and balances throughout the trading day via third-party websites, or from day to day using CSI's pristine end-of-day database. Unfair Advantage's® resident currency cross-rate file allows Position Manager to display international markets in their native currencies, while simultaneously valuing your account in the currency of your choice (e.g., U.S. Dollars). Position Manager is a simple and easy-to-use module within Unfair Advantage (UA) that is being made available free of charge for an extended introductory period. We are offering it now, during what we consider to be a "Beta Testing" phase, to hasten the testing period. If you are interested in being among the first to use this product and would like to help us get the kinks out, please consider joining us in this endeavor. Below are basic instructions and interpretations for using Position Manager. These are subject to change as we revise and refine the software. To begin, you'll need the very latest version of Unfair Advantage. This requires ordering a CD from CSI, or, if you already have version 2.5.3 that was received on disk, you can download the current upgrade from the website. As this Journal goes to press, that would be v.2.5.4, but the next upgrade (2.6.0) might be ready by the time you read this. Check www.csidata.com/ua/uax.html to make sure you have the latest version available. Once the proper UA has been installed, you can launch Position Manager from UA's Trading Tools menu, from the Unfair Advantage program group through your computer's "Start" menu, or directly from your desktop. At launch, a matrix appears with the heading "CSI's Position Manager." Below is a tool bar of functions you'll use for manipulating the program. Options include "File," "Records," "Positions," "Account," "Report," "Settings" and "Refresh." When you first get started with this market tracking product, the main part of the Position Manager screen is an empty display showing the spreadsheet columns of "Symbol," "Quantity," "In Date," "In Price," "Stop Price," "Commission," "Current Price," "Profit/Loss" and others. To enter a trading record into this initial listing, click "Records" from the tool bar, and then select "Add" from the drop-down menu. The "Symbol Selection" screen that displays will allow you to choose between commodity, fund, stock, stock option and commodity option market types for your first entry. Make your choice, and then either enter or select the appropriate symbol and (if needed) the delivery month, option type and strike price. Note that multiple stocks can be selected simultaneously. Click [OK] to proceed. Example: From the Market Type dialog box, I clicked the arrow to see a menu of choices, and then clicked "Commodity." I then entered "C" for CBT Corn in the "Symbol" box, and 200312 in the "Contract" box to capture the currently traded December of 2003 contract. This took several seconds because the lengthy factsheet details for all commodities had to be loaded from disk. The symbol(s) you enter will be inserted into the spreadsheet, but you will need to add a little more information to complete the trade record. Click the corresponding cell in the third column (labeled "Quantity," which probably says, "Long 0") and replace the entry with the appropriate direction (Long or Short, or + or -) of your position and the number of shares or contracts. Once you enter your first symbol, Position Manager's update browser will launch. Example: Upon entering my Corn position, the software showed a quantity of 0 contracts, and the Current Price for the March 2003 contract as 243^6, which represents a price of $2.43 and 6/8ths cents per bushel. I then entered my contract quantity of "Long 10" to show that I had purchased ten long corn contracts. My "In (entry) Price" of "240^0" could be entered either as 2400 or 240^0. The "In Date" was October 1st (entered as 10/1). When a deliver month is shown as a letter (such as Z for December), Position Manager assumes the present contract from the forthcoming 12-month period. See below for a screen shot of Position Manager showing this example and more. Enter a "Stop Price" if you would like Position Manager to notify you if and when the market reaches a given threshold. Your position will be monitored and Position Manager will alert you if the market turns against you. Enter the full round-turn "Commission" to make the Profit/Loss calculation as accurate as possible. Our example shows a $20 commission for the Corn contract. All commission references within UA are based upon the total number of shares or contracts traded or entered for the quantity you specified for a particular stock or futures contract. To deviate from this convention and default to a fixed price per share or price per contract would not factor in economies of scale for larger transactions. There are other control columns in the spreadsheet that help you track account assessment details, such as the company name or commodity name that corresponds with the symbol. Also included is the data source, which identifies CSI, INO.com or YAHOO® as "C", "I," or "Y," respectively, and for closed positions, the "Out Price, and the "Out Date." A Position Manager screen showing the proper entries for a deposit, a mutual fund, a December 220 Put option for Corn, General Electric stock, the overseas commodity Dried Cocoons, London Tin and the 12/03 Corn futures contract. You may add rows to the Position Manager matrix for as many market symbols as you wish to examine. If you are not sure of a given stock or future's symbol, simply click on the [.] button inside the Select Symbol window. You can then select the market from the complete CSI factsheet for your given market type. If your symbol is not found in the overall list, please contact CSI with the symbol, the company name and the country of origin. If at all possible, we will add it to our inventory. Please note that you should only add to or delete items from your position list by going through "Records" from the tool bar. Attempting to add futures from the spreadsheet matrix may terminate your application and require a reboot. Example: The second item I entered into my position list was 3-month forward LME Tin. To introduce this market, I again chose "Add" from the "Records" menu and verified that the Market Type box read, "Commodity." I wasn't sure of the symbol, so I looked it up in the CSI factsheets by clicking the button adjacent to the "Symbol" box with three dots (.). It is important to wait a few seconds for the CSI Fact file to completely load. When the factsheet finished loading, I went to the Market Type box at the right side of the screen and selected "All Cash/Fwd/Fundamental Series." This series defines non-standard markets, including the LME forward markets. I scrolled through the list to find # 46 Tin OHLC (3 mth) - LME, (CSI # 2042, symbol MTN2) and checked the selection box by clicking it. Then I clicked [OK] to close the factsheet, and found that the tin had been added to the Symbol Selection dialog. The cash/forward markets don't have specific delivery months, so I entered 54, which is a long-standing CSI convention for cash and other non-standard series. I clicked [OK] to return to the Position Manager screen and then edited the entry further with "Long 1" for "Quantity," "4000" for "In Price" and "120" for "Commission." Because some investors may trade multiple accounts or wish to assess groups of investments individually, Position Manager permits you to maintain multiple position lists (portfolios) with unique names. To create a new list, click "File" from the tool bar and then click "New Position List" from the drop-down menu. A "Save As" dialog will display. (Note that the "Default.DB" position list shown holds any positions you may have entered into the original screen.) You now have an opportunity to identify a unique name for your new list. In writing these instructions, I simply entered the filename "Tutorial" and clicked [Save]. Position Manager automatically added the .DB extension, indicating that this is a DB format file. To enter your various markets and positions under Position Manager, use the "Add" feature on the "Records" menu as described above. Whenever you launch Position Manager, the last position list you viewed will display by default. You may choose another by clicking "File" from the tool bar and then selecting from the existing lists. You can add to or remove cash from each account reflected in your position lists by simply choosing the desired list and then clicking "Account" from the tool bar. Select "Deposit" or "Withdrawal" as desired, and a dialog will display for entering your transaction. Your account will be credited or debited in your account's currency of choice as defined through the "Settings" menu, as shown above. Position Manager's "Current Price" values are provided either from your resident UA database using your most recent update or from third-party Internet sources. You can turn the Internet updates on and off through an entry on the "Records" menu that you access from Position Manager's tool bar. If only UA data is to be used, be sure to update your UA database with current prices BEFORE launching Position Manager. If you forget to do this, you should exit Position Manager, update the database with UA, and then restart Position Manager. As you add investment products to your position list, new quotes will be sought and added. When current prices are updated using the Internet, associated fields are dynamically filled from background quoting software about once per minute. Although Position Manager will automatically seek new data on a regular basis, you may initiate additional updates from the Internet by clicking "Refresh" from the tool bar. CSI is well known as a supplier of end-of-day data on a daily and historical basis for mutual funds, U.S., Canadian, and U.K. stocks, world futures, futures options, indices, etc. CSI does not supply real-time or intraday data on any markets; however, we do direct users to various sites to obtain recent quotations on U.S. stocks or futures during trading hours. There are several classes of data content that might be considered in interpreting the quotes in your portfolio. Mutual funds are always priced according to the last known (yesterday's) net asset value, so these prices are obtained from the resident UA database and use "C" as the quotation source. Similarly, non-U.S. futures market quotations, quotes for stocks not covered by live websites, and non-U.S. option market quotes are obtained from the resident UA database. Most active U.S. stocks are obtained from YAHOO, which captures such information from the Island Exchange almost real time. They show "Y" as the source. U.S. futures information and information on the pricing of options are obtained from INO.com with a 20-minute delay. These show "I" as the source. CSI does not guarantee the accuracy of any of the information provided. Intraday quotes do not become part of the Unfair Advantage database. They are not available for charting or other manipulations. CSI's Position Manager is very straightforward for stocks and funds. The "Quantity" field holds the number of shares held, which, in turn, will affect the reading in the total "Profit/Loss" column. Profits and losses are calculated as the "Current Price" less the "In Price" per share, less the total transaction commission. The "Profit/Loss" value for the given line represents the ongoing profit or loss in tradable points. When evaluating a symbol from the futures or options categories, the contract size is factored into the resulting "Profit/Loss" calculation. The "Break-Even" field is simply the entry price plus the commission, after converting the commission to trading units. It represents the required exit price that will recover commission costs. The Balance line at the base of the spreadsheet reduces all entries shown in points to a cumulative figure shown in the trader's native currency or an alternative currency of choice. If a commodity is introduced that trades in British Pounds or Japanese Yen, for example, the actual profit or loss shown will have been converted to the trader's native currency using the most recent British Pound or Japanese Yen cross-rate reference from the UA database. 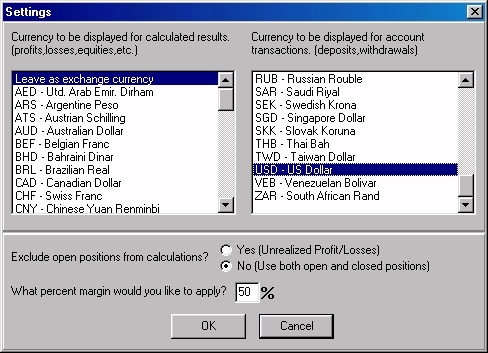 Note that your choice of currency is applied to all position lists, and can be easily changed at any time. For futures markets, the contract size is shown on the display so that the user may verify the value of the profit or loss field. Position Manager multiplies this quantity times the net profit or loss to date to come up with the profit/loss value shown. We have also shown the commodity conversion factor (CF) as a reminder of how a given product is represented and traded. Example: The current corn price of 243^6, less the "In Price" of 240^0 represents a profit of 3 3/4 cents per bushel. There are 5,000 bushels in a CBT corn contract (see the "Contract Size" column in the spreadsheet). Five thousand times 10 and contracts times 3 3/4 cents represents a $1,875.00 profit in the trade, less the commission of $20, which leaves $1,855.00 net. This Position Manager tool is also able to log in profits and losses over time as trades mature. Note that the "Positions" option on the tool bar lets you select from viewing Open trades, Closed trades or All trades. A couple of columns in the spreadsheet report make it easy for you to show ongoing "Out (Exit) Dates" and "Out Prices" for your positions. Position Manager, therefore, will maintain statistics on your completed trades. Those statistics may be helpful to you when your year-end income tax report becomes due. Position Manager is not an accounting program so far as taxes are concerned, but it should make it quite easy for you to maintain good records and follow your investments over time. In the course of running Position Manager, your screen may be visited with pop-up ads from YAHOO or INO.com, which are the sources for the live quotations updated on a time-deferred basis. Unfortunately, the pop-up screen interruptions are a necessary condition of use because these vendors want visitors (you) to observe their displays and their advertisements in exchange for providing you with their live or delayed data. CSI simply makes it easy for you to obtain timely information by taking you to appropriate sites when you request fresh information on your specified markets of interest. We did not suppress vendor displays because we believe capturing the substance of the supplied information is more than worth the tradeoff of viewing advertisements. Please be sure to read and abide by the copyright restrictions and provisions of those vendors, which are posted on source sites. CSI reserves the right to remotely default to the CSI prior-day or end-of-day database details for quotations should any quotation vendor limit or restrict CSI customer visits to their sites. Thank you for taking the time to learn about Position Manager. We look forward to feedback from our Beta Test users, which will help us get this product ready for general release in the very near future.